Well, let’s compare German and Chinese. So, in your opinion, which one of these two languages is easier to learn? Okay, probably you are an English speaker, and as English is a Germanic language, it is far easier for you than Chinese. 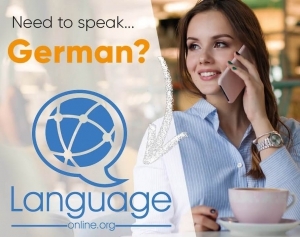 But, due to the this fact that the English language has its roots in the German language, I would even say that German might be the easiest foreign language for English speakers to learn! Ha ha. Have you noticed what I just did there? Well, I betrayed you. Actually, I just needed some context to illustrate the topic we are going to talk about today. Exactly, today’s topic will be the German superlative and comparative! Hurrah! So, after this magnificent introduction to this topic, we will define what we are actually talking about. After that, I’d like to show how you can use the German superlative and comparative in different situations – in the right way, of course. In the following, let’s clear up what German superlative and comparative actually are. What is the German Superlative and Comparative? Actually, it’s quite easy. Well, it’s a lot easier than… Ok, Ok… I’ll stop here. Let’s just try to clear up directly what we are talking about. In case you want to compare two things, people, thoughts, actions, qualities or what so ever, you need a German comparative. German Superlatives are used when you want to make a claim that something, relative to all others, has the most or least of a given characteristic. By the way, these definition is also valid for the superlative and comparative in the English language. So, due to these similarities, I don’t think that this topic will be too difficult to you. Anyway, in case you want to compare things, people, thoughts, actions and so on, and these two compared attributes are equal, you just have to the expression “so” (as) and “wie” (like) between them. Of course, instead of a German superlative of comparative. So, let’s have a look at some examples that will illustrate what we just tried to define. In the following part of this article about German superlative and comparative, we will have a look on the way these constructions are formed. First of all, let’s try to figure out what it the formula behind the German superlative and comparative. So, let’s have a look at the English ones. Here, we have the two suffixes -er for the comparative and -est for the superlative. Well, it is actually a good idea to keep this kind of forming in mind, because German superlative and comparative are formed in a really similar way. First, we will have a look on the word endings of adjectives and adverbs you use to form German superlative and comparative. So, as we have already mentioned above, there is a huge similarity between the English and the German forms. Well, to form the German superlative and comparative, you add the following suffixes the adjectives and adverbs. Additionally, the word “am” comes before the adjective or adverb you want to express in the superlative form. But I’d like to talk about that a little bit more detailed later on. 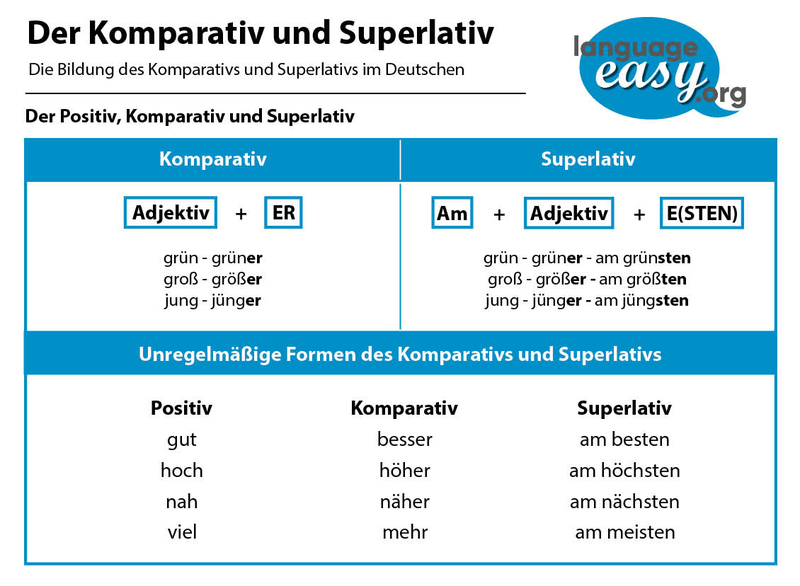 Of course, we are learning German superlative and comparative. So, this means that there don’t exist any rule without exceptions. In this case, there are some irregular German superlative and comparative forms in case of some monosyllabic adjectives. Unfortunately, you just have to learn them by heart, there is no other way to learn them. In the following, I’d like to show you a table with the most common irregular superlatives and comparatives. Additionally, you have to keep in mind that in German, in contrast to English, you can not put forms like more or most in front of your adjective to form a German superlative and comparative. Well, comparing things, thought, actions or whatever in English is actually quite easy: You simply use the word ‘than’. So, in German, you have a similar structure when you look at comparison: The word “als”. Logically, you construct a comparison as followed. “Ich bin schöner als er.” – I am more pretty than him. As already mentioned above, you just use the suffix “-er” to form the comparative. After that, you add the word “als” and you are done. Now, let’s talk about the word “am” I have mentioned in the paragraph above. Well, “am” is simply the word you throw in when you want to express the German superlative. Actually, it’s a short version of “an dem” (at the). So, you can notice clearly that, in comparison with the comparative, the word “am” comes before the adjective you express in the superlative. Well, we have reached the end of this article about German superlative and comparative. Hopefully, I could give an idea the rules that form these forms of adjectives and some basics of their application. In case you want to go into some more details, just have a look at the wikipedia article about German grammar.